Blu-ray is basically the highest standard of home video excellence. With the right TV, Blu-ray player and stereo system, you can have a cinematic and immersive movie watching experience at home. But long before Blu-ray became mainstream home entertainment system, DVD was the most common media player in most households. Some people might own a Blu-ray player as well as a DVD player at the same time. You may use your Blu-ray player to watch the Blu-ray movie with your HDTV. But when you attempt to watch it with your DVD player in your room, things might not go your way. Yes, you can. Technically, the video coded that Blu-ray videos use is m2ts and the capacity of a Blu-ray disc is 25GB per layer. And a DVD-5 disc can hold 4.37GBs of data while a DVD-9 holds about 7.95GB. As you can see, the capacity of an ordinary DVD disc is too small for Blu-ray content. But that doesn’t mean you can’t convert Blu-ray to DVD. Actually there are several different ways for you to convert Blu-ray to DVD. The fastest way would be using a Blu-ray to DVD converter. There are programs capable of directly converting Blu-ray to DVD. Another way is to rip the Blu-ray video to your computer and use another piece of video burning software to burn the video to a DVD disc. 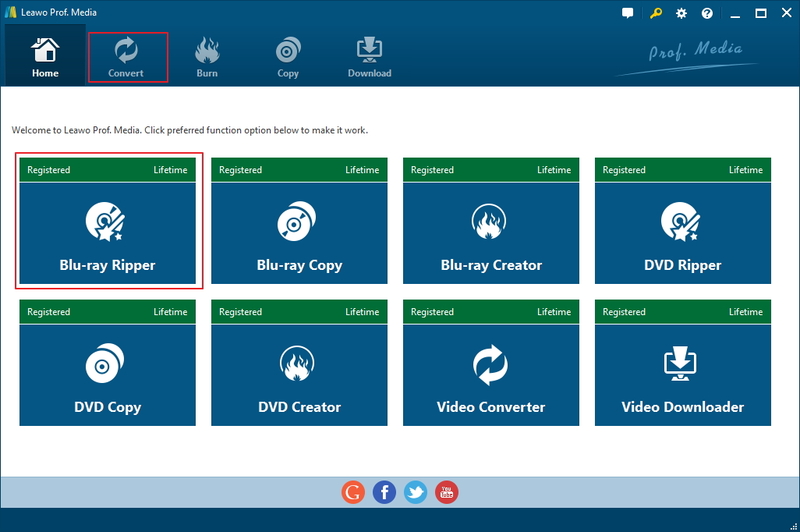 In this section we’ll be showing you how to use one program to help you directly copy Blu-ray to DVD disc. In order to do that, first we will need to find a suitable program. It should be able to remove copy protections on a commercial Blu-ray disc as most commercial discs are encrypted with protection and without the ability to unlock the content on the disc, the program would be worse than useless. Another feature it should have is the ability to remove the region codes on the Blu-ray discs, allowing the resulting DVD to be played on any DVD players users could possibly have. The above two features are considerably the most important ones that a qualified piece of Blu-ray to DVD converter should possess. With that in mind, we started searching. The best Blu-ray to DVD converter we found is called Leawo Blu-ray Copy. Not only is it able to crack the copy protections on most commercial Blu-ray/DVD discs, it can also remove the region codes for the backup copy, thus allowing you to play the copy on any DVD players. Furthermore, the program supports converting and compressing Blu-ray content to DVDs. You are allowed to convert content of a Blu-ray disc to a DVD folder or DVD ISO file and save them to your computer’s hard drive or directly compress and copy the Blu-ray disc to a DVD disc providing that you have two disc drives for that. Below is how to copy Blu-ray to DVD with it. Note: Considering that most people only have one disc drive, I’ll show you how to copy Blu-ray to DVD disc with one disc drive. Seeing as Blu-ray drives can read DVDs but DVD drives won’t be able to read Blu-ray discs. So the disc drive we use will and have to be a Blu-ray drive and it should support disc burning. Step 1. 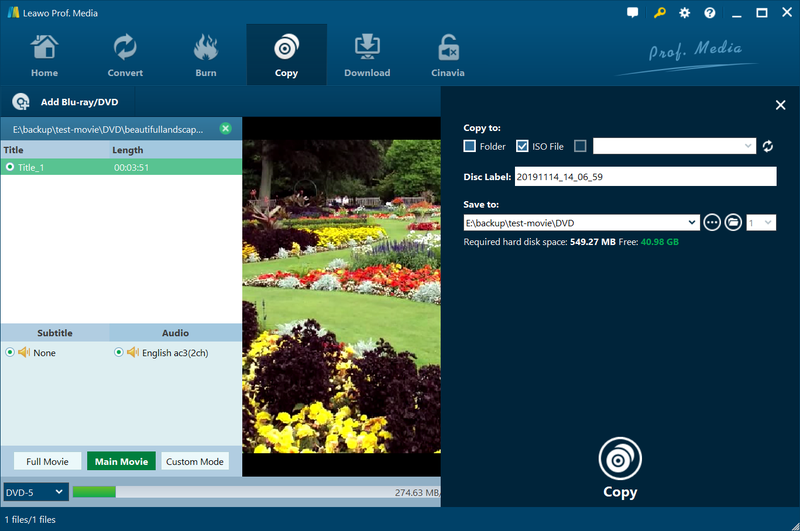 Leawo Blu-ray Copy is one part of a large software package called Leawo Prof.Media. So after you have the program installed on your computer, you will actually see Leawo Prof.Media rather than Leawo Blu-ray Copy. 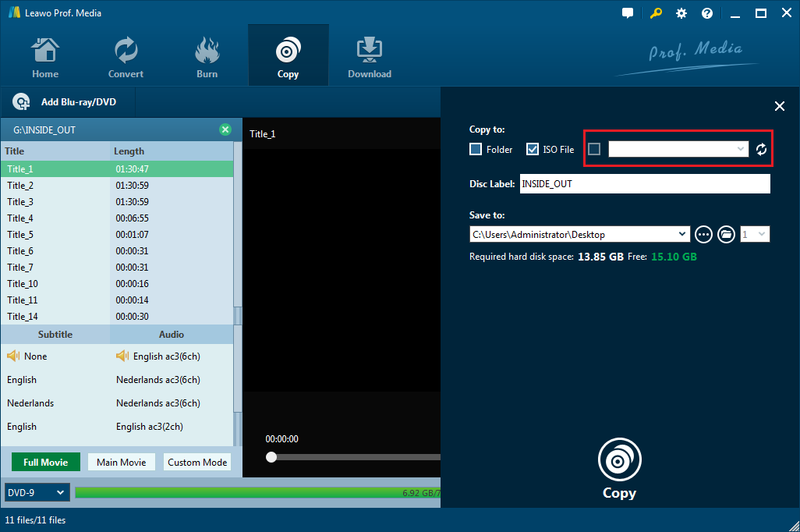 The shortcut of Leawo Blu-ray Copy is in the main interface of Prof.Media. 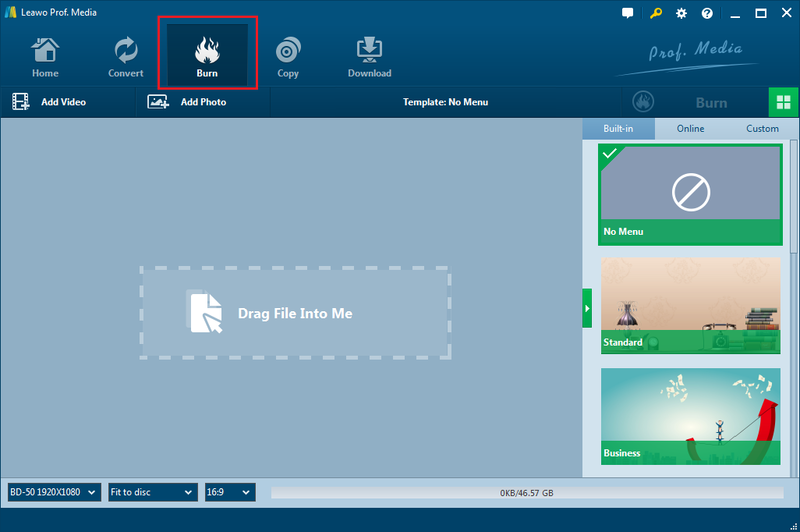 So just launch Prof.Media after installation and click the Blu-ray Copy shortcut after entering Prof.Media’s main interface to launch Blu-ray Copy. Step 2. Place the Blu-ray disc in your disc drive and give your computer and the program a few seconds to read the disc. You can have the disc inserted in your disc drive before starting Step 1 as well to get it ready in advance. After the program recognizes the disc, click Add Blu-ray/DVD from the upper-left area of the interface and following that is a drop-down menu with 3 options on it. From top to bottom are Add from CD-ROM, Add folder and Add ISO File. Select Add from CD-ROM and click the new option that follows to add Blu-ray content to Blu-ray Copy. Step 3. The left sidebar on the following interface contains several settings that we need to go through. First you are required to select what content to copy and save to the DVD copy. As you can see from the sidebar, all videos, subtitles and audio tracks are listed on it. You have 3 buttons below the lists to help you quickly select different content. Click the Full Movie button to directly have all the content selected. If you choose to use the Main Movie button, then the program will automatically have the longest video selected to save in the copy. You can also use the Main Movie button to select the videos, audio tracks and subtitles by yourself. Step 4. Below the 3 copy mode buttons you should see another button that shows the current format for the copy. Click on it to display a drop-down menu that contains all the disc format you can convert the Blu-ray movie into. From here you can select DVD-9 or DVD-5 to have the Blu-ray disc converted to DVD-9 or DVD-5 discs. Step 5. Click the Copy button in green background to display a new panel. 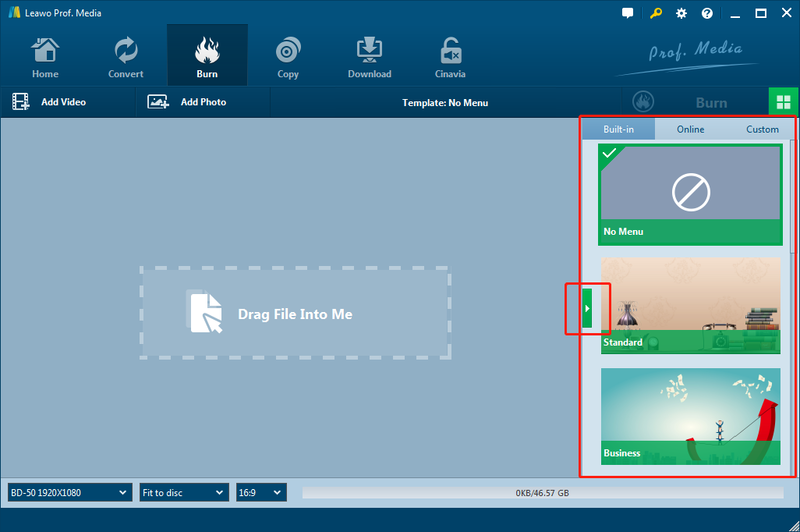 Check either Folder or ISO File on the top of the panel and the program will convert the Blu-ray content to a DVD folder or an ISO file according to your choice and save them to your hard drive. Set where to save them in the Save to box. And then start converting Blu-ray to DVD by clicking the Convert button. Step 6. To create a DVD disc with the DVD files you got from the last step, first have the DVD files imported to Leawo Blu-ray Copy. Just close the app and open it again. Click Add Blu-ray/DVD content after loading Blu-ray Copy and this time we use either Add Folder or Add ISO File according to the type of copy you’ve created. You can also directly drag the source files to the program to import them. Step 7. Considering that the files have already had all the content you need, just directly choose Full Movie this time. Step 8. Choose a disc format the same as the one you chose in Step 4. Step 9. Click the green Copy button to see the panel again. Get the original Blu-ray disc out of the drive and put a recordable DVD disc in. Check the third option on the top, find the DVD disc from its drop-down menu and select it. And then click Copy at the bottom to start burning the DVD files to the DVD disc. Note: If you have two drives, you can have both drives connected to your computer and directly choose the recordable disc as the target to copy the Blu-ray content to in Step 5. That way you can directly copy Blu-ray to DVD at one time without having to create a copy in your hard drive first. Another way to convert Blu-ray to DVD is to have the original Blu-ray content converted to a video first and use a video burning program to burn the video to a recordable DVD disc. Remember Prof.Media we used in the last section? It contains 7 other modules other than Leawo Blu-ray Copy. And we can another two modules to rip the Blu-ray disc and burn the video to DVD disc. The module we are using to rip the Blu-ray disc is Leawo Blu-ray Ripper. The video burning module is Leawo Blu-ray Creator. Leawo Blu-ray Ripper can rip copy protected Blu-ray/DVDs and have the Blu-ray/DVD movie converted to various video and audio formats. The Blu-ray Creator module supports burning videos in various formats to Blu-ray/DVD discs with high quality. Here’s how to convert Blu-ray to DVD with the two modules. Step 1. 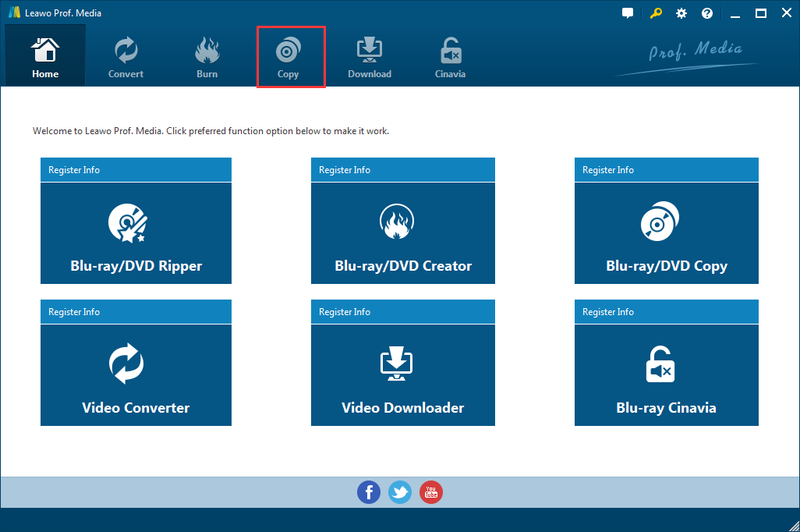 Enter the source Blu-ray disc in your Blu-ray drive, launch Prof.Media and click the Blu-ray Ripper button to load Blu-ray Ripper module. Step 2. Click Add Blu-ray>Add from CD-ROM to have the source Blu-ray content imported to Blu-ray Ripper. Step 3. Similar to Blu-ray Copy, you are asked to choose which videos to rip, but you don’t have to choose videos and subtitles in this step. Use the 3 buttons to pick out the videos you need in a faster manner. Click Full Movie to select all the videos. Choose Full Movie to select the longest video, which usually is the main movie. Choose Main Movie to enable manual selection. Click OK and the chosen videos will be transferred to a new video list for other settings. Step 4. 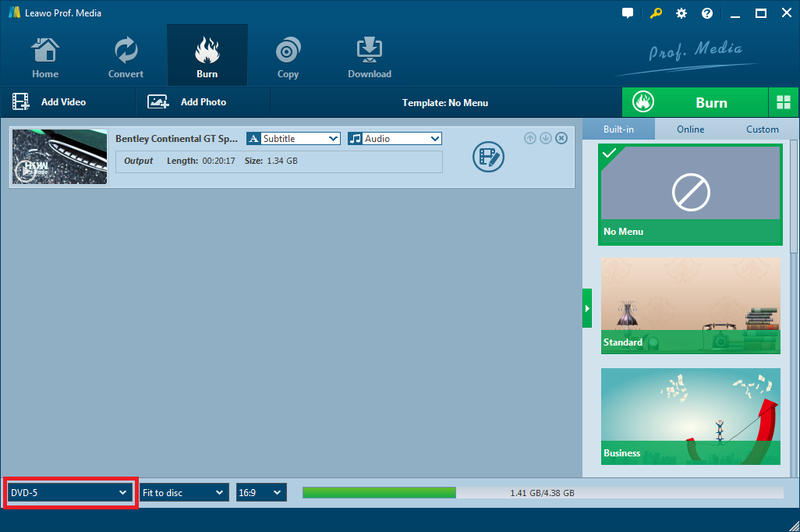 Click the Format button with the MP4 Video label on it and click Change to open the format panel and select a format for converting the Blu-ray movie into. 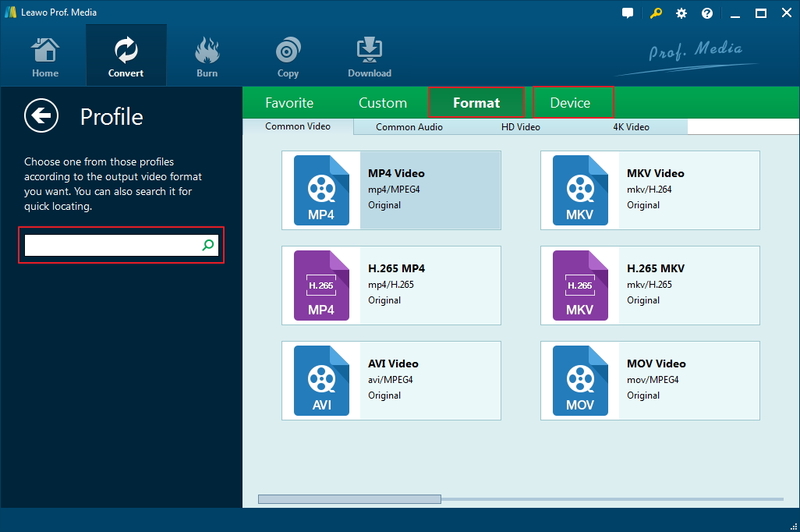 You can choose a common video format like MP4, AVI, or MKV. Step 5. Click the Convert button above the video list to display a new panel. Set where to save the output video in the box on the top and start ripping the Blu-ray disc with the Convert button at the bottom. Step 6. 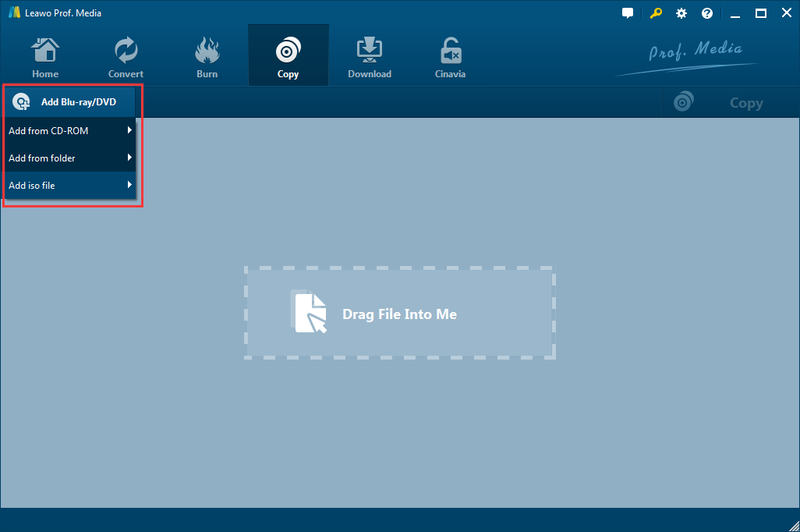 When the ripping process is finished, click the Burn button from the upper-left area of the interface to open Blu-ray Creator. 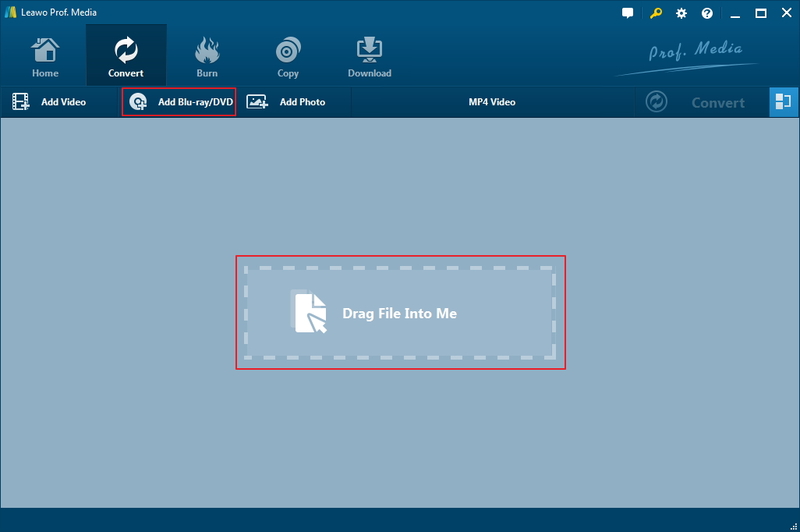 Directly drag the videos you get from Step 5 to Blu-ray Creator’s interface to add them to the program. Step 7. Choose a disc menu from the provided ones on the disc menu sidebar on the right. If you don’t want to use disc menu, just choose No Menu. Step 8. Click the disc format button in the bottom-left to choose disc format between DVD-9 and DVD-5. Step 9. Click the Burn button above the right sidebar and a new panel will show up. Put a recordable DVD disc in your disc drive and select it as the target by checking the third option on top of the sidebar. Click on the third option and choose the DVD disc from the drop-down menu to confirm that it’s chosen as the target for the videos. And then start burning the videos to the disc by clicking the Burn button at the bottom. A nice piece of DVD player software would make the movie watching experience much nicer on your computer. Note that Microsoft didn’t have DVD player software installed in Windows 8 and above. So you will need a third-party DVD player to play DVD disc. Here we have two free and practical pieces of DVD player software to recommend to you. Leawo Blu-ray player is from Leawo, the same company that creates Blu-ray Creator, Blu-ray Copy and Blu-ray Ripper we used above. And it’s completely free. It can not only play Blu-ray/DVD discs but also videos in various formats. 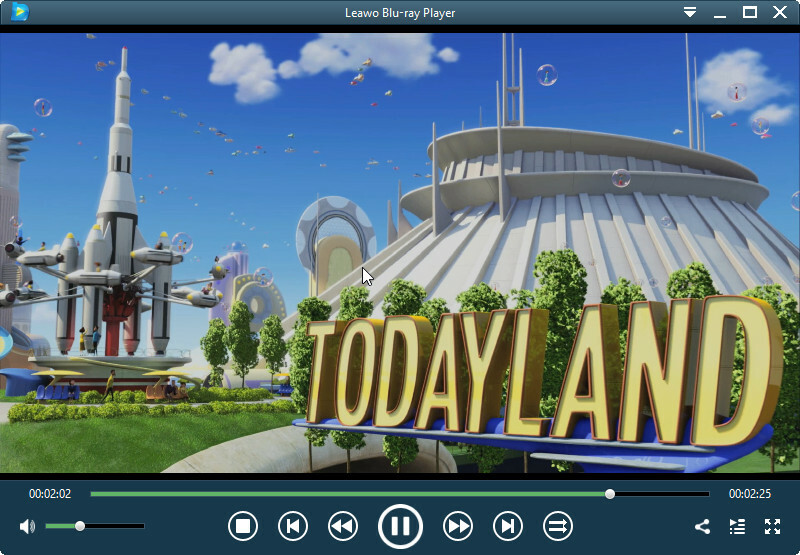 It supports playback of videos and Blu-rays in resolutions of up to 4K. It can also read Blu-ray/DVDs with copy protection and region codes. 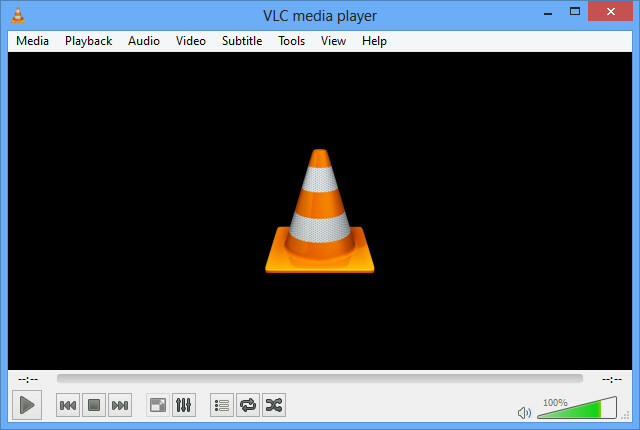 As one of the most famous open-source cross-platform video player, VLC can also play DVD discs. You can directly load and play the DVD disc directly on Windows 8 and above. And it can even rip DVDs to MP4 with it.